Today’s bourgeoisie indeed has much to lament. The smoothie that contemporary culture has become, in which others’ ideas are combined, recombined or merely embellished, prevents and denies any real opportunity for true originality. It is unfortunate, but culture predates our pitiful existences by many millennia. Whether one is optimistic or otherwise, this blender is very, very full. 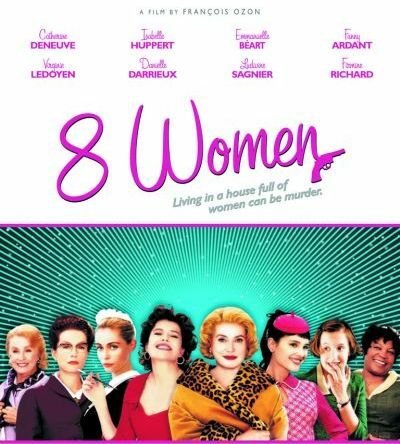 Following such reasoning, any and every epiphany that follows the viewing of 8 Women (2002) that considers its surprising similarity to the game, Cluedo, is neither inspired, nor unique. A quick internet search confirms it thus. However, the very same internet search reveals that online writers generally only employ this idea for the linguistic purposes of the glorious segue, or for a passing comment. It does not appear that anyone has constructed any substantial piece of writing with an 8 Women/Cluedo twist. As it was in 1789, victory lies once more with the bourgeoisie: originality can be feigned. WHODUNIT? In a remote country mansion, eight women, all masters of deceit and spontaneous musical numbers, gather to celebrate Christmas in the midst of a very icy French winter. Up a pithy flight of stairs, dwelling mysteriously in his room, is patriarch Marcel (Dominique Lamure) face down with a knife between his shoulders, apparently quite dead. This game of Cluedo has partially been solved; we know that little, taunting envelope in the middle of the board contains the cards “bedroom” and “knife”, but what of the last card? Which of these women committed the murder, and why? Was it the resplendent matriarch, Gaby (Catherine Deneuve), who had not of late maintained the best relationship with her husband? Money as it turns out, isn’t everything, especially when it doesn’t exist in the first place. Was it Mamy (Danielle Darrieux), who never really liked Dominique to begin with? Wheelchair bound for a sizeable portion of the film, she makes a miraculous recovery, making a spritely dash up the stairs before being sequestered in a closet by her relatives for an enforced time-out. Apart from that, she doesn’t seem to do much else. Was it Augustine (Isabelle Huppert), secretly in love with her sister’s husband? Pale, uptight and dressed in very austere attire, our resident hypochondriac is the poster-woman for repressed sexuality, a role that Huppert seems born to play. Was it Louise (Emmanuelle Béart), the family’s newest maid whose saucy past comes back to haunt her? It is certain that she was the last to visit the bedroom, bearing a late night spot of tea, but uncertain what it was exactly that she did there. Was it Pierrette (Fanny Ardent), the cash-strapped sister of our murder victim? Despite an unfortunate name and vicious insinuations pertaining to her profession, Pierrette is anything but innocent and her late arrival sets tongues, tails and fingers wagging. Was it Suzon (Virginie Ledoyen), returned mysteriously and prematurely from boarding school? Dressed entirely in pink, it is revealed that she and her ridiculous hat maintained an unorthodox relationship with her father, the late Dominique. Was it Madame Chanel (Firmine Richard), the loyal and tolerant servant with a penchant for gambling? Despite her fidelity to the family that seems to have spanned at least a generation, fingers are quickly and unfairly pointed right at her head. Or was it little Catherine (Ludivine Sagnier), the only character in the film to wear trousers and the only one who seemed to actually love her father unconditionally? As accusations fly, the narrative and its premise are gradually drawn out in a vitriolic fashion, each woman in turn playing the part of private investigator. Like hyenas, they rip themselves to shreds before the timely – and a highly anticipated – dénouement. The timing of said dénouement is unfortunate as there was certainly time for at least another awkwardly performed musical number, more odious, circular argumentation and another badly acted lesbian make-out scene. Woe indeed. True to whodunit form, the end is unflatteringly banal. The truth expounding envelope in the middle of the board is compelling no more. Just as it is in a game of real world Cluedo, one is either too drunk or disinterested to care who the murderer is and wishes to stamp all the plastic characters into the rug until they resemble a dropped packet of sprinkles. ‘Whodunit?’ organically gives way to ‘Where’s dinner?’, and not a moment too soon. Agatha Christie would be so proud. This entry was posted in Film and tagged celluloid relapse, film. Bookmark the permalink.